The count is done! The numbers are in! 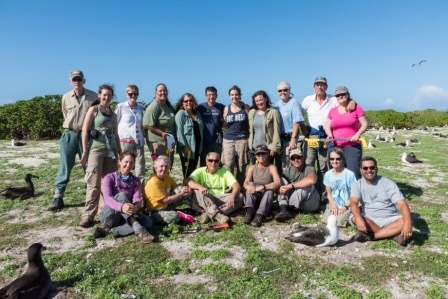 Another annual Albatross Census is on the books! We captured a group photo of all 18 counters, having completed our final sector on Sand Island, before the troops disbanded. Each year, as the G3 jet is too small to take all of us, a few remain on island until the next flight out. They are fondly referred to as ‘The Leftovers’, and this year I am one. Since there were also some US Fish and Wildlife (FWS) staff who needed to leave, only 11 of the counters departed on Thursday night’s flight, and seven Leftovers remain. We are now officially assigned to FWS as volunteers, to help on whatever projects need extra bodies, such as habitat restoration or bird surveys. Our mission the past couple of days has been to help identify new or expanded areas of mouse attacks on nesting albatross. The attacks were first noticed during last year’s count; once the albatross started nesting again this year the problem recurred and spread rapidly. The FWS biologist here, Meg, gave us an evening presentation soon after we arrived, so that we could alert them if we saw signs of injuries while counting. The images she showed us, caught on remote infrared cameras, were extremely distressing. The tiny field mice climb onto a nesting bird and eat into their back, neck or head. An albatross goes into a kind of trance when incubating its egg, so doesn’t seem to be able to fend off its attacker. The injuries can be extensive and quite a number of birds have died from infection; many have abandoned their nests; many more are still nesting while suffering various degrees of bites. The mice are by no means new to the island, though numbers have soared since rats were completely eradicated. We don’t exactly know what caused the mice to start attacking the birds last year, though some theories suggest it might have to do with them losing some of their previous food sources. We would be out in the field right now, but it’s been bucketing down all day with no sign of stopping before nightfall, and work is suspended til tomorrow, so I gained some time to write a post instead. I suspect that surveying and baiting will be our main tasks for next week; I’m not sure what else we’ll get involved in beyond that. I’m just very grateful to have the extra days to enjoy this spectacular place, even in the pouring rain. 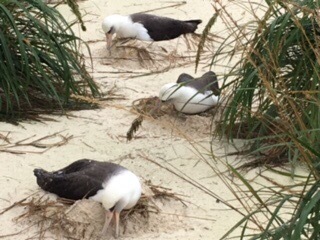 The albatross are taking advantage of today’s weather, to drink the raindrops and build up their nests while the sand is wet!